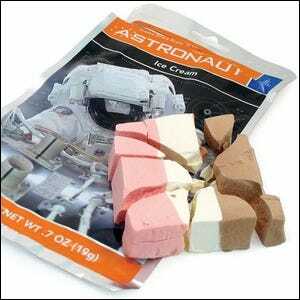 Which Mission Was The First And Only Time “Astronaut Ice Cream” Flew In Space? The First McDonald's Happy Meal Movie Tie-In Was For Which Movie? In 1968 Apollo 7, the first manned mission in the Apollo space program, spent 11 days orbiting the Earth conducting experiments and enjoying ration packs that included a crumbly but creamy delicacy: Astronaut Ice Cream. Developed in the mid-1960s by Whirlpool Corporation, under contract from NASA, the resulting treat was a bit different from the ice cream you’re used to. Recreating the flavor and mouth-feel of ice cream when there would be no freezers and a risk of liquid ice cream droplets floating around the space craft led the scientists at Whirlpool to create an unconventional sort of ice cream. Their ice cream started life as a regular block of the cold delicious treat enjoyed by millions but rather than ending life packaged in a wrapper and destined for a freezer, it was placed in a specialized freeze drying chamber which drew out all moisture while maintaining the flavor and shape of the slab. The end result was the peculiarly dry and crumbly block of Astronaut Ice Cream many a curious museum going child has cajoled their parents into buying. Despite the fact that the freeze-dried ice cream was developed by request of Astronaut Corps members, it proved to be a rather unpopular menu item and was retired from the menu after only one trip into space aboard the Apollo 7 command module.